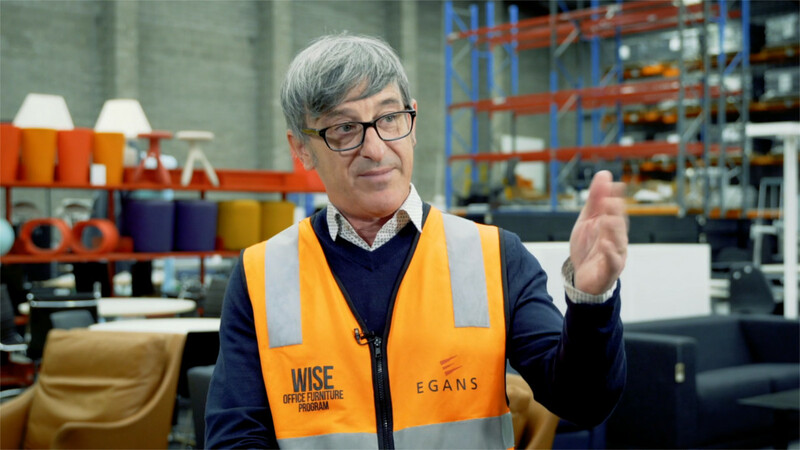 Egans’ business model is based on a ‘circular economy’ delivering a sustainable solution to our global resource challenge. Our Wise Office Furniture Program engages in a retail, wholesale, and recycle methodology for commercial furniture. We extend the life of furniture for our customers wherever we can. Where assets can no longer be used, we’ll move them through to other parts of the economy by swapping, sharing, or selling. We’ll refurbish assets so that clients can extend their usage. When assets are no longer usable, we recycle them; break them down to their component parts. They then go back to the manufacturer and return as new pieces of furniture. We transform on average 120,000 assets per year. Either back into the corporate environment or out via wholesale or recycle yards. About 40% of the furniture we get is broken down into component parts, and those components (metal, melamine, plastic etc.) go to down stream suppliers or to landfill. The Ellen MacArthur ‘circular economy’ shows us that extension of life is what really matters and whilst recycling is important, it’s just the very end of the life extension journey. It’s about enabling a piece of furniture to be used and re-used for the length of it’s life as it was intended when it was built. Our customers benefit from both an environmental and financial outcome all in one.